OLPC's new wundertablet hit the market today in the US, and the specs are just as disappointing as I expected. The XO Tablet, or XO Learning Tablet to be more precise, is a basic 7" tablet with specs comparable to many $99 tablets currently on the market. It's running a custom suite of learning apps on top of Android 4.1 Jelly Bean. You can find this tablet for $149 at Walmart. According to its website, this tablet has a dual-core 1.6GHz CPU, 1GB of RAM, a pair of cameras (1.3MP and 2MP), Wifi, 8GB internal storage, and a microSD card slot. The screen measures 7", and the screen resolution is the same as on the current Nexus 7 or KFHD (1024x600). This tablet comes equipped with a mike, g-sensor, accelerometer, compass, and HDMI out. The XO Learning Tablet weighs in at an unremarkable 340 grams, hasa 3.9Ah battery, and is about the size as your average 7" tablet. I haven't had a chance to get my hands on this tablet recently, but I do know that the hardware was largely designed by Vivitar, OLPC's hardware partner. I also know that this tablet is Google certified, so it will have full access to Google Play. Given that Google Play contains at least some adult content, it's probably a good thing that the XO Learning Tablet also includes parental controls similar to the ones found on the KFHD, Nabi 2, Nook HD, and other leading tablets. 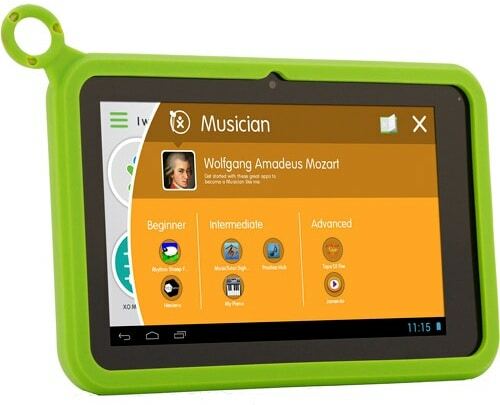 The XO Learning Tablet is also going to ship with a suite of 100 learning apps in both English and Spanish. It will also have 100 ebooks, also in Spanish and English. 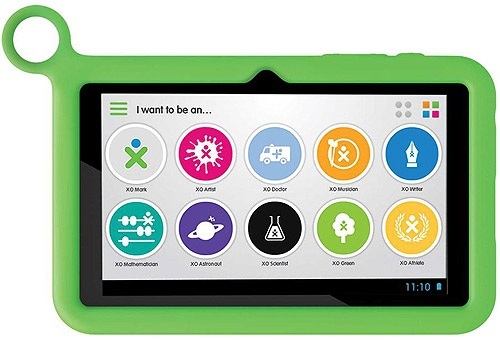 When OLPC announced last week that the XO Learning Tablet would be available today, I wasn't sure that there was any strong reason to recommend this tablet over the competition. I still haven't seen anything to change my mind, so at this point I would suggest that you look at similar educational tablet like the Fuhu Nabi 2 before buying this tablet. I can't compare the software, but I can tell you that the Nabi 2 and a lot of other tablets have better specs than XO Learning Tablet, including a more powerful CPU and graphics chip. If you are thinking about buying a tablet to use as more than just an educational tool then the better specs might be the deciding factor.